The division Lycophyta includes clubmosses, spikemosses and quillworts. 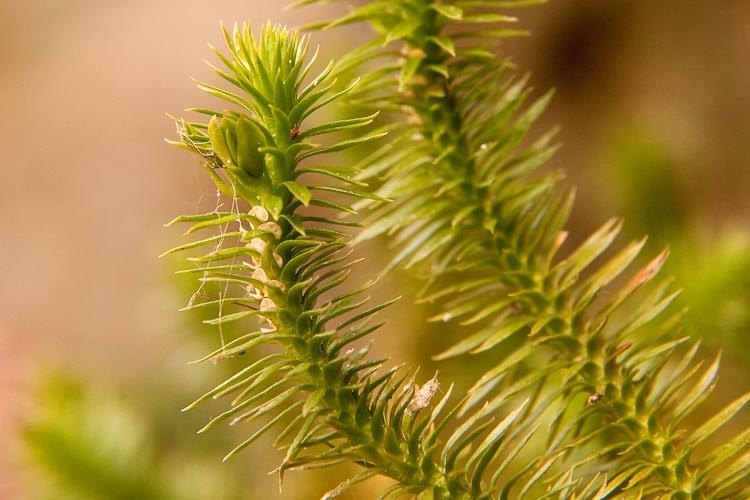 These plants can be thought of a relicts of a glorious past, as woody clubmoss ancestors were tree-like during the aptly-named Carboniferous Period of the Paleozoic Era (approx 360 to 300 MYA), which, together with ferns and horsetail ancestors, formed coal. Clubmosses are the most prevalent lycophytes in Ohio. Their sporophytes are erect, with branching horizontal running stems. The leaves are tiny, needle or awl-shaped, in whorls around the stem. The sporangia are often in a terminal club-like cone (strobilus) consisting of a tight spiral of pale reduced leaves (sporophylls), each with a single sporangium in its axil. 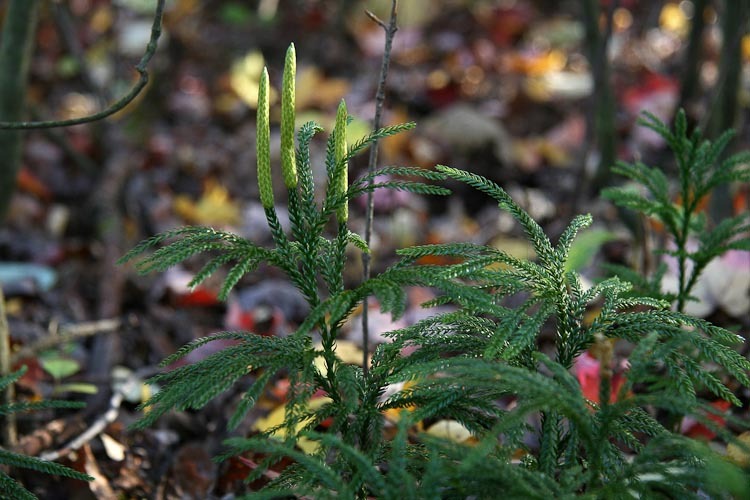 Tree clubmoss, Lycopodium dendroicum (formerly L. obscurum) is an example of a typical clubmoss. 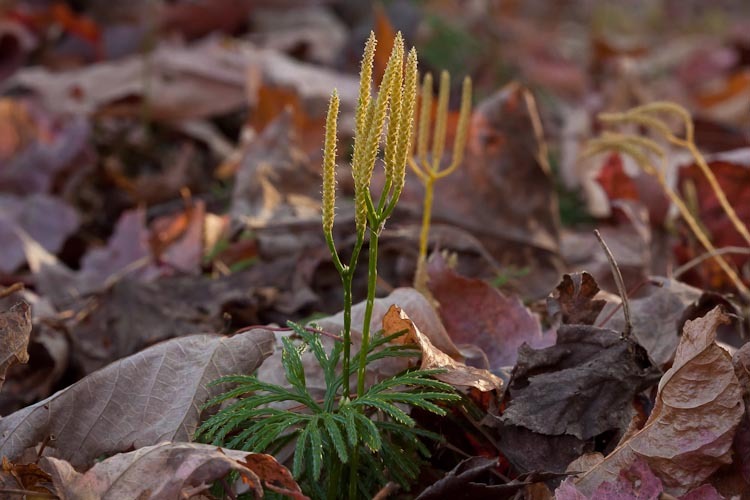 Tree clubmoss sporophytes are evergreen with needle-like leaves. The sporophylls are arranged in a club-like strobilus. Clubmosses are homosporous, i.e., producing one type of spore, that develops into a gametophyte that produces both male and female gametangia (antheridia within which sperm are formed, and archegonia that contain an egg). By contrast, the much less common spikemosses and quilworts are heterosporous, i.e., producing megaspores and microspores in separate sporamgia, with megaspores developing into female gametophytes, and microspores into male ones. The gametophytes are tiny and subterranean. Sperm must swim through environmental water to reach the egg. 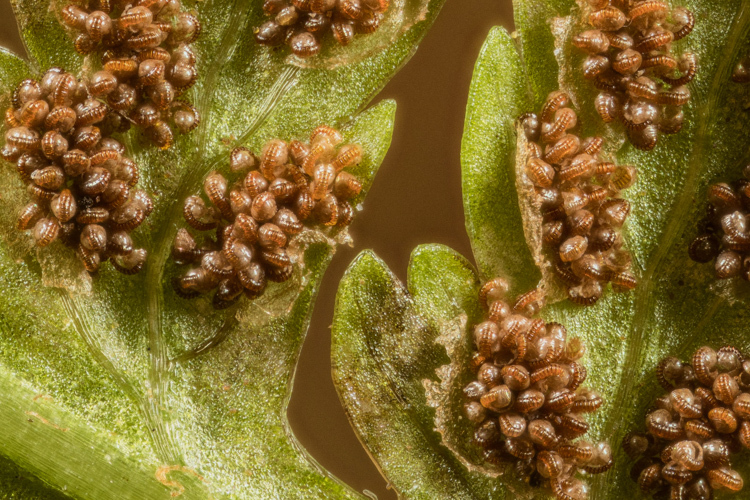 Some clubmosses produce their sporangia not in a club-like strobilus, but instead in the axils of ordinary foliage leaves. Shining clubmoss, Huperzia lucidula, is an example. Shining clubmoss sprorangia are in the axils of normal foliage leaves. “Fan clubmoss,” Diphasiastrum digitatum, is perhaps out most common clubmoss. It produces tree-like sporpophytes with flattened sprays of foliage. The inaptly named “ground pine” is a non-seed plant. Here’s an ultra-dorky little video featuring spore release from ground pine. Until recently, horsetails and scouring-rushes were placed in their own division Equisetophyta (Sphenophyta), but recently they’ve been shown to be quite closely related to ferns, and placed with ferns in their division Pterophyta. So let’s call them tube “tube ferns”! The horsetails/scouring rushes have jointed hollow stems and a rough ribbed texture; the stems contain silica. The leaves are small and scale-like. Along with clubmosses and ferns, these plants are relicts of a glorious past, as their ancestors were tree-like during the Carboniferous, and help to make up coal. The gametophytes are tiny and subterranean. Sperm must swim through environmental water to reach the egg. All of our horsetails/scouring rush plants belong to one genus, Equisetum. The un-branched horsetails are generally called “scouring rushes” because they are whip-shaped (rush-like) plants with such a rough texture that they have been used for souring pots and pans at campsites. Our most common scouring-rush, Equisetum hyemale grows in dense patches in wet open woods. Scouring rush sporophyte stems are un-branched. 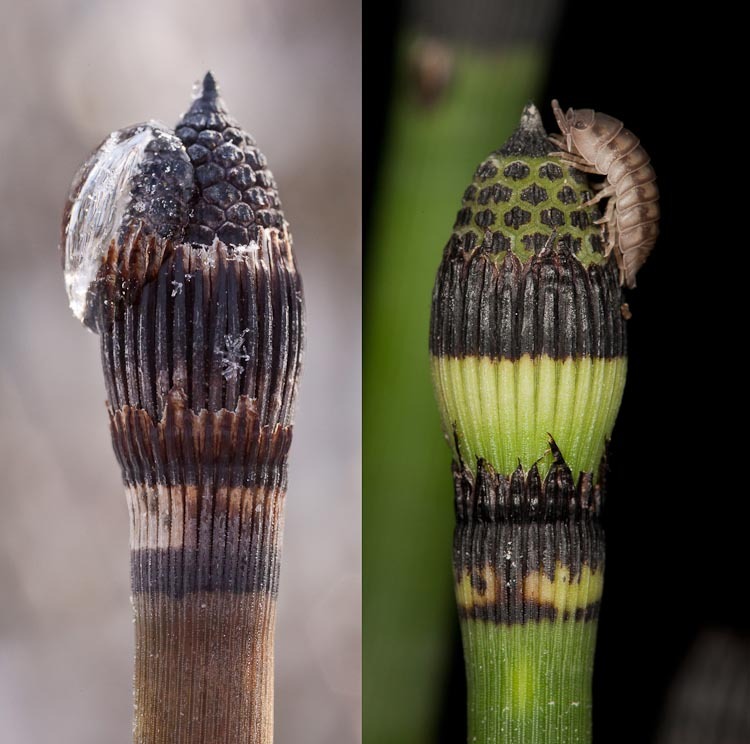 The leaves of horsetails/scouring rushes are tiny black scale found in whorls around the peculiarly jointed stems. Horsetail/scouring rush leaves are tiny, scale-like, in whorls around stem. 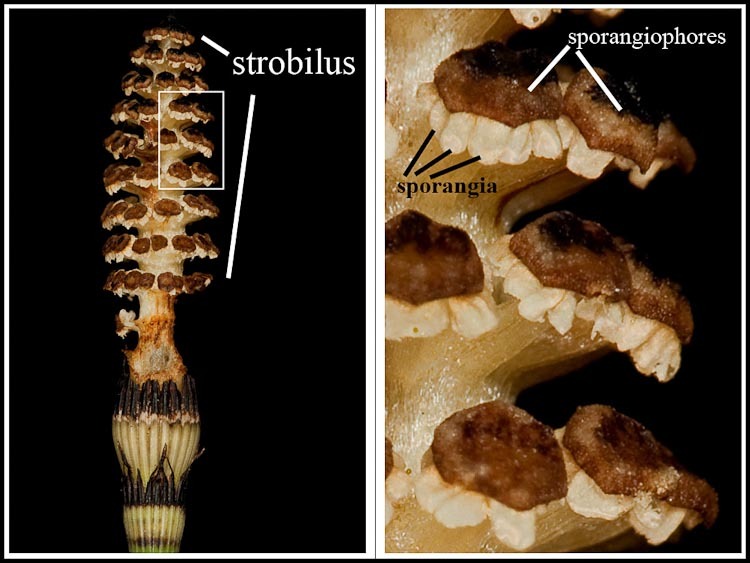 Horsetails/scouring rushes present their sporangia in complex cone-like strobili consisting of spirally arranged hexagonal and peltate (umbrella-shaped) sporangiophores, the margins of which are draped with small bag-like sporangia. Equisetum sporangia are arranged on the margins of 6-sided peltate sporangiophores. The sporangiophores are situated in a terminal cone (strobilus). Our un-branched Equisetum species, i.e., the “scouring rushes” are tough, rugged, evergreen plants. Scouring rush is a rugged evergreen plant. 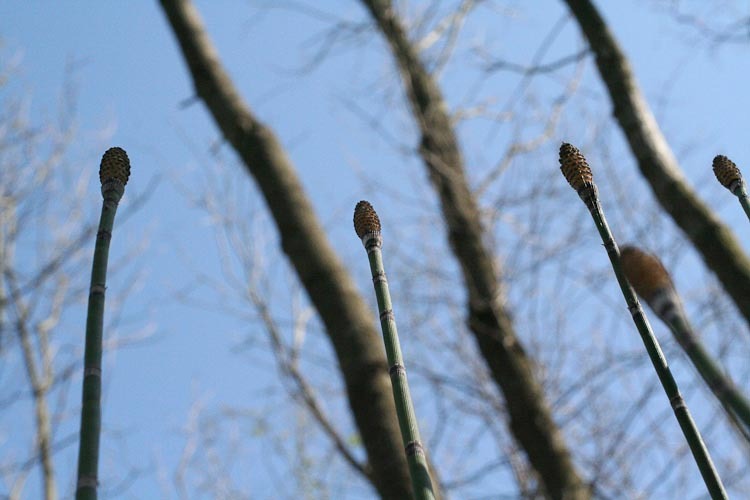 Several of our Equisetum species are branched, with a softer texture, and, while they are perennial, the stems die back at the end of each growing season. These are the “horsetails” named for their similarity to that animal part. 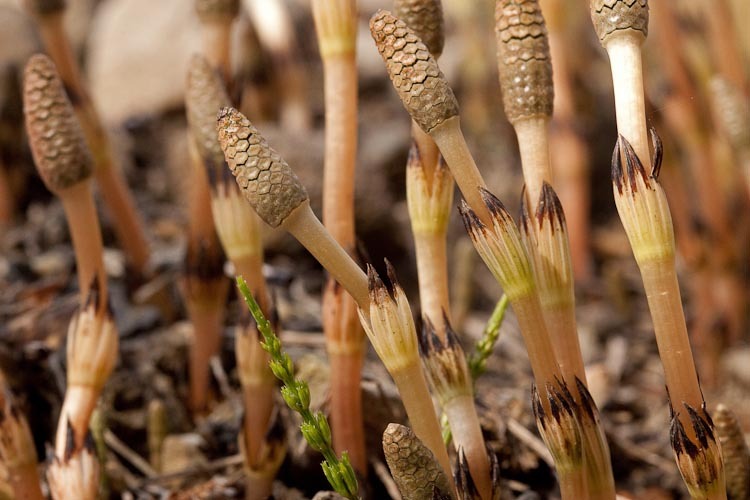 Horsetail stems are dimorphic, i.e., of two types: (1) early-appearing and short-lived stems that are wholly devoted to the production of spores and whither away by late spring, and; (2) wholly vegetative ones that persist through the growing season. These are the “fertile” stems of common horsetail, Equisetum arvense. Common horsetail is dimorphic with respect to stem production. All but two of these stems are “fertile,” devoted entirely to spore production. 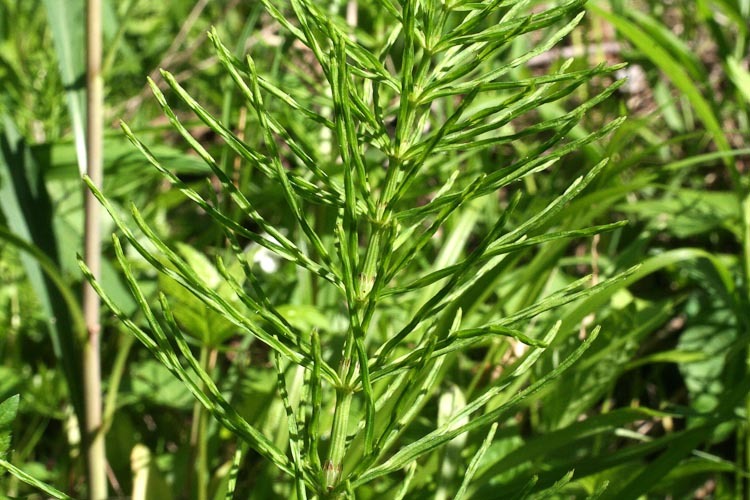 The non-spore-producing stems of common horsetails are longer-lived, green and photosynthetic, helping the entire plant (fertile and sterile stems connected by underground rhizomes) acquire resources. Common horsetail vegetative stems are long-lived, and much-branched. 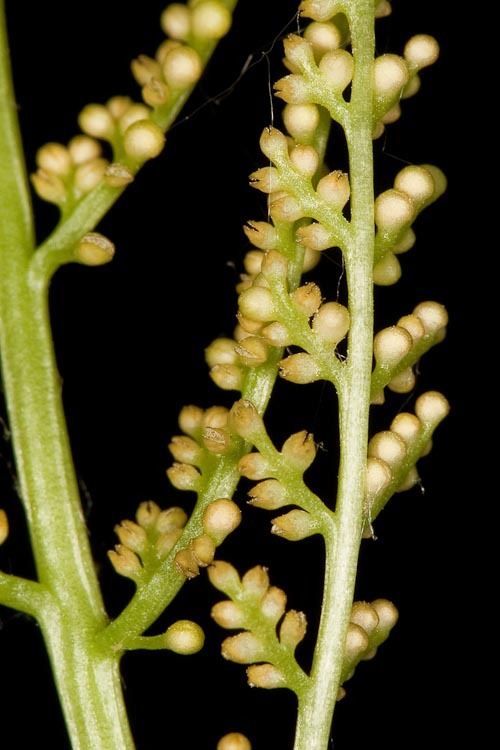 Tiny globose black sporangia are in clusters called sori, covered by an indusium. 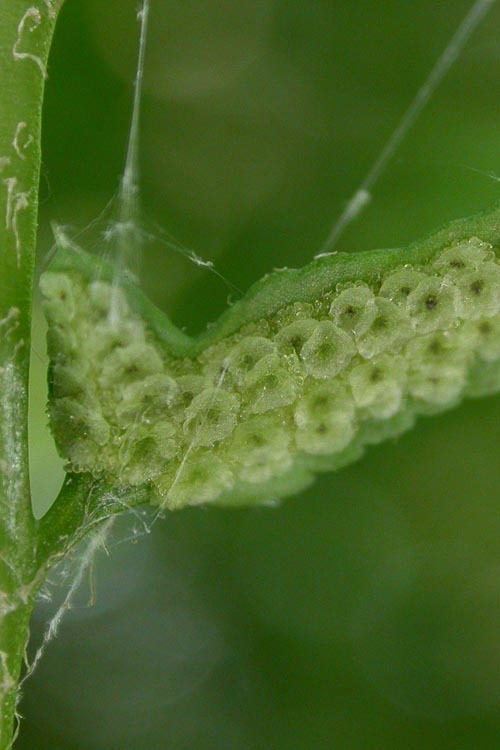 So called “eusporangiate” ferns have large thick-walled sporangia that split apart without the help of an annulus. Our eusporangiate ferns are a few genera in the “adder’s tongue” family (Ophioglossaceae), easily recognized by the production of a grape-like cluster of sporangia on a separate portion of a heteromorphic leaf. Rattlesnake fern is a eusporangiate fern, with large thick-walled sporangia. 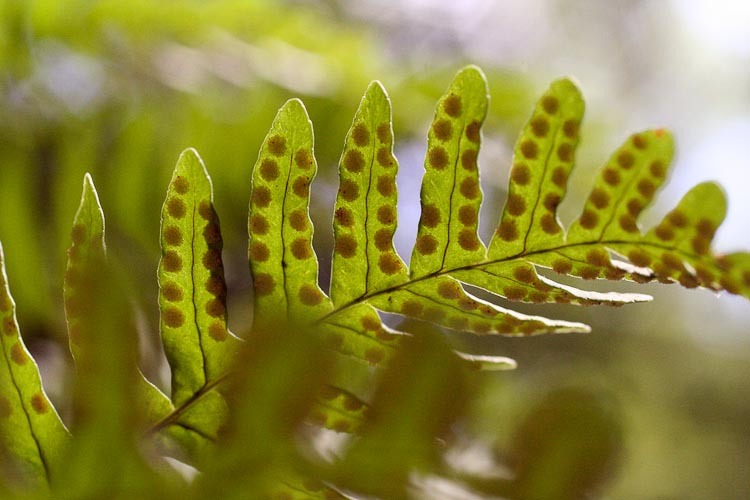 Fern spores germinate to form a small flat heart-shaped gametophyte, sometimes called a “prothallus.” Sperm require environmental water in order to swim from the antherium to the egg in an archegonium. After fertilization, the diploid sporophyte is formed, which at first is attached to its maternal gametophyte. Soon the gametophyte withers away completely, as the robust sporophyte, the dominant life cycle stage in all plants except the “bryophytes” takes form. 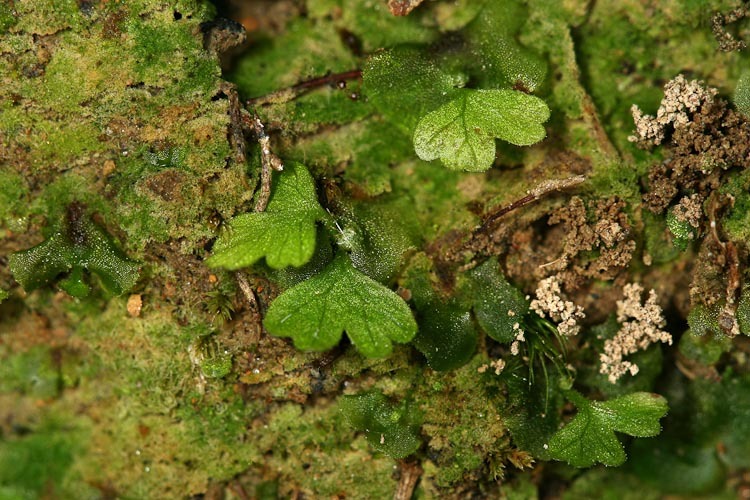 Fern gametophytes are small, green, flat and short-lived. The developing sporophyte begins development attached to its maternal gametophyte. 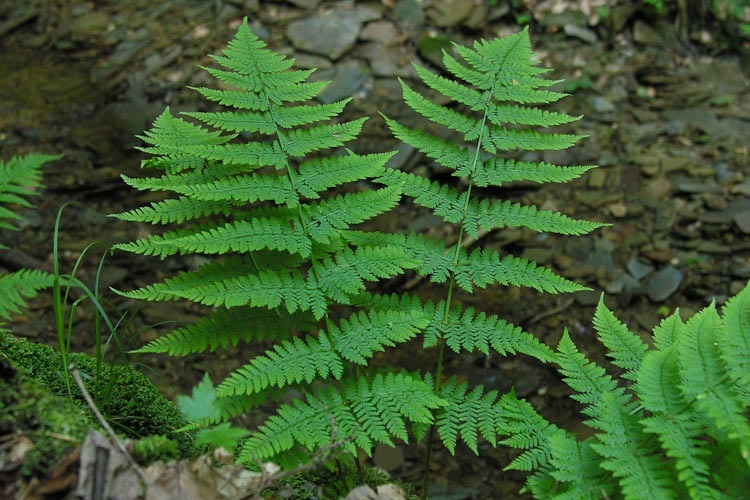 Fern identification is assisted by attention to three sets of traits. 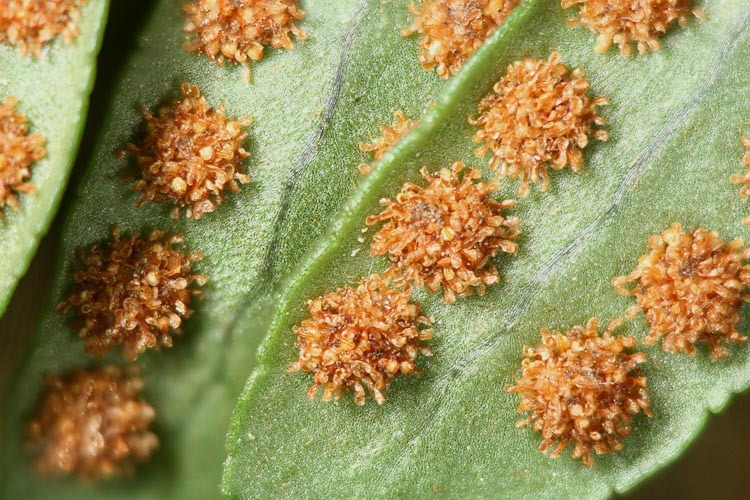 A MONOMORPHIC fern produces spores beneath otherwisde normal-appearing leaves. 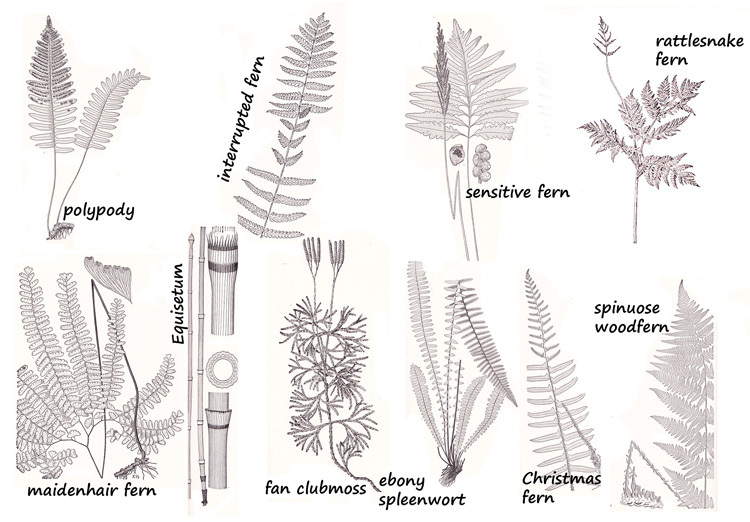 A DIMORPHIC fern produces strikingly different types of fronds devoted entirely to spore production, or wholly vegetative (called “fertile frond” and “sterile frond” respectively). 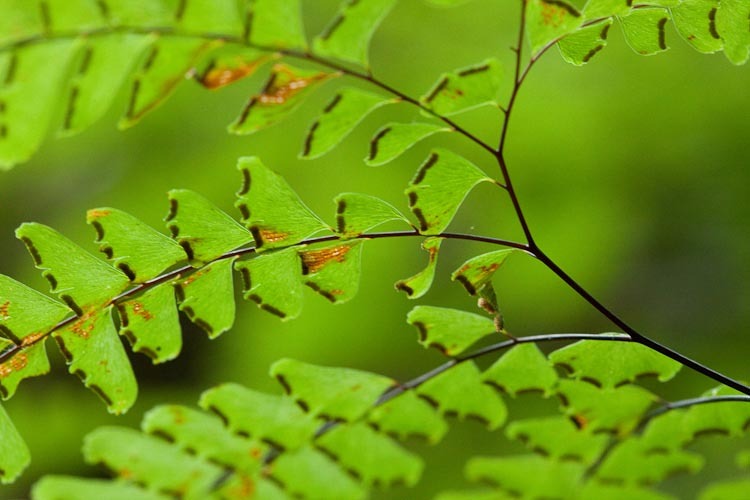 An ENTIRE frond is wholly undivided. A PINNATIFID frond is lobed. A PINNATE fron is wholly divided into separate leaflets (see rachis between the leaflets). 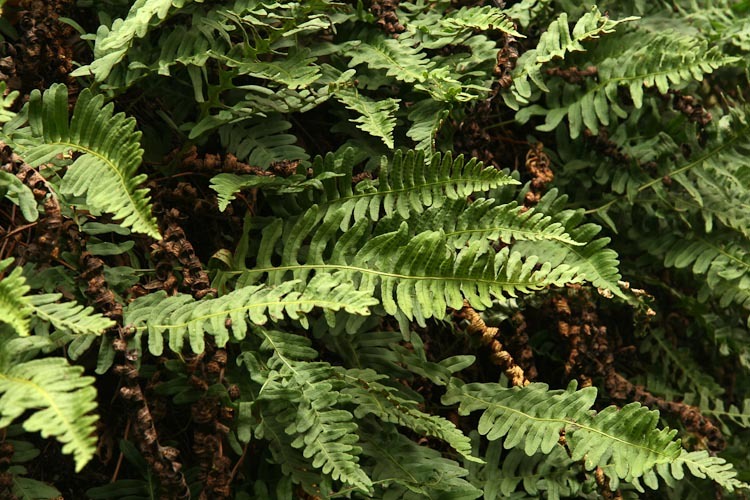 A PINNATE-PINNATFID fern is wholly and completely divided into leaflets AND the leaflets are lobed. …and so on (BIPINNATE-PINNATIFID, and TRIPINNATE). 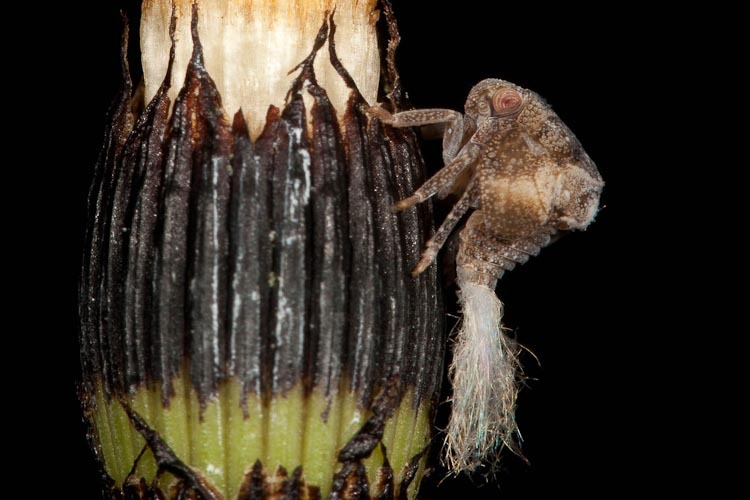 NAKED SORUS has no indusium. A FALSE INDUSIUM consists of the margin of the leaf, curled under to cover the sori. 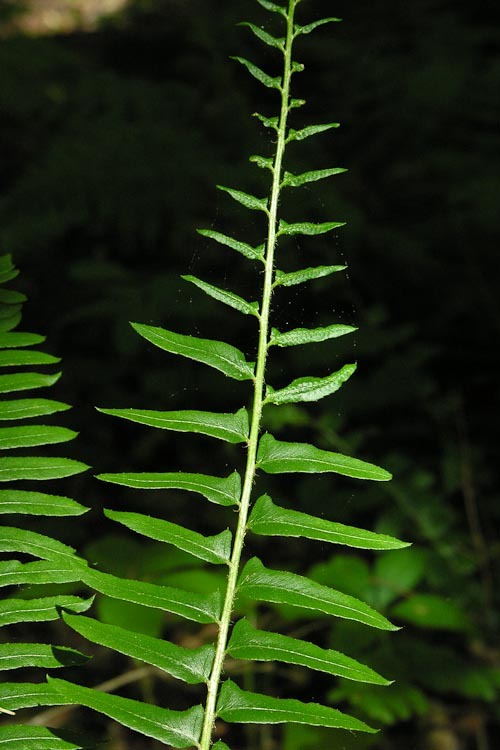 A PELTATE INDUSIUM is circular, and attached to the fern leaf blade by a central stalk. A RENIFORM INDUSIUM is kidney-shaped. A LINEAR INDUSIUM is long and narrow. 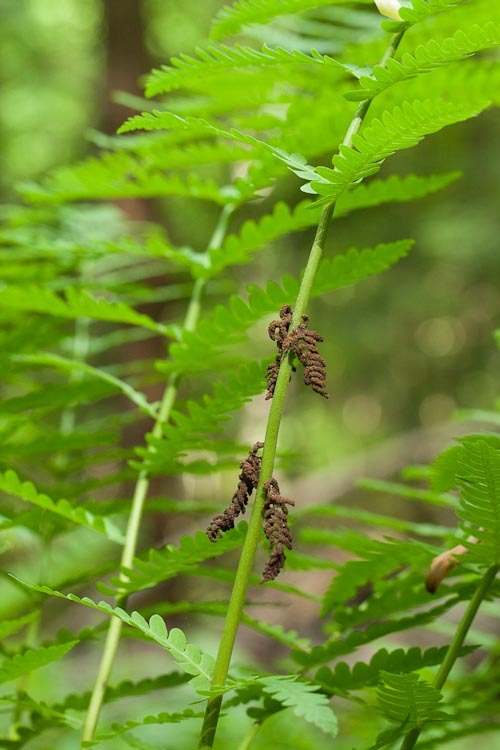 Three quite large ferns in the genus Osmunda are common in swamps and wet woods. 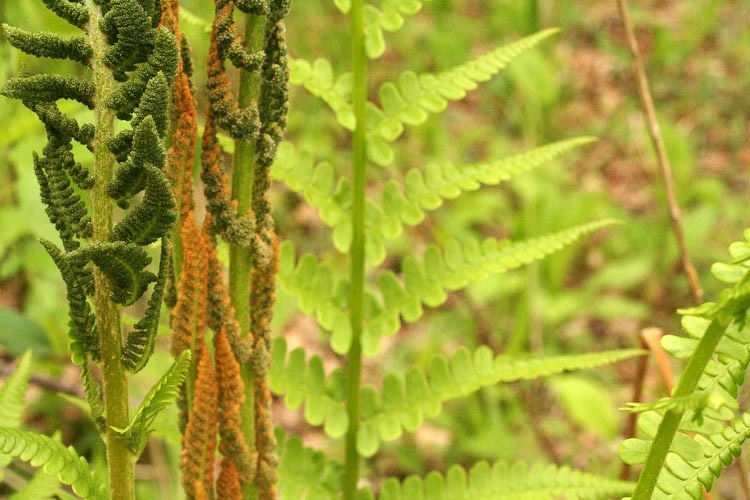 The one called “cinnamon fern” (Osmunda cinnamomea) is strikingly dimorphic. 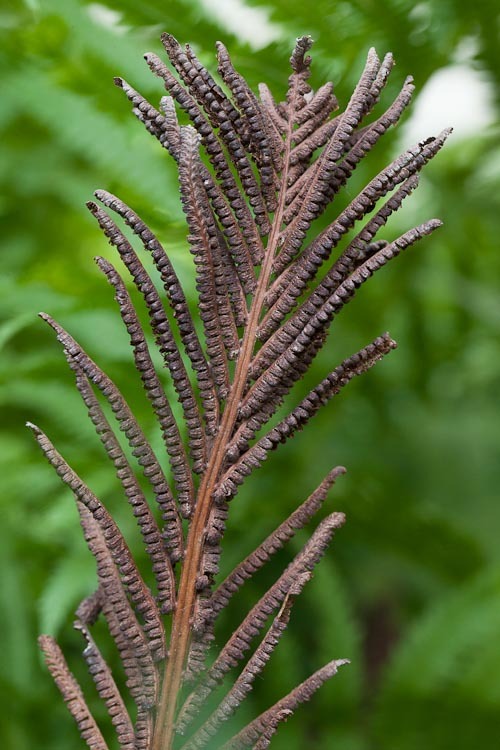 Cinnamon fern grows in circular clusters of large fronds having a deeply pinnate-pinnatifid frond dissection type, from a vertically oriented rhizome (underground stem). 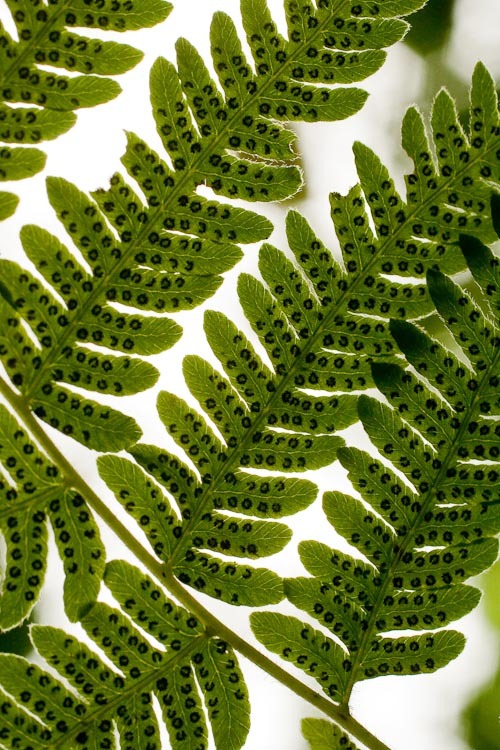 A few central fronds are entirely devoted to the production of spores. 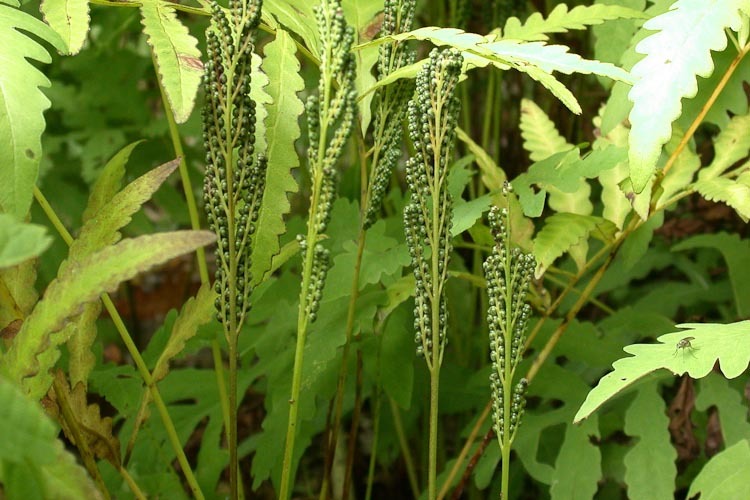 Sporangia in the genus Osmunda are huge (compared with most ferns). Interrupted fern, Osmunda claytoniana is is a woodland fern with a very similar deeply pinnate-pinnatifid sterile frond much like that of cinnamon fern, but which is heteromorphic. 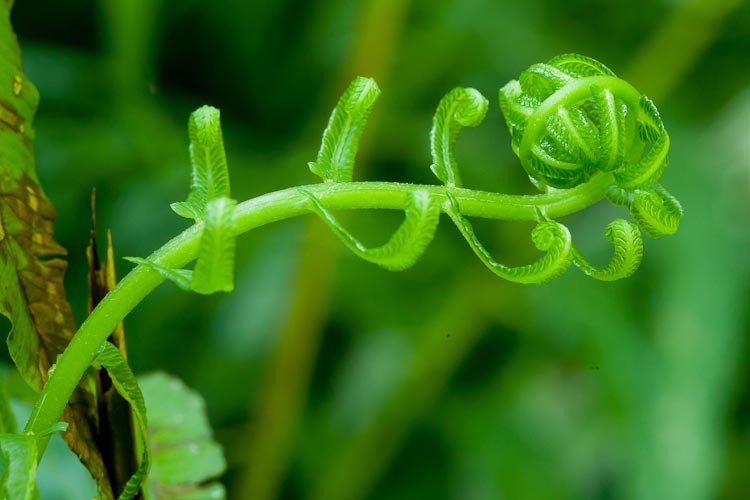 The fertile leaflets are interspersed with sterile ones on some fronds, where they “interrupt” the pattern of the frond. Interrupted fern has a heteromorphic frond, with a few fertile leaflets (pinnae). 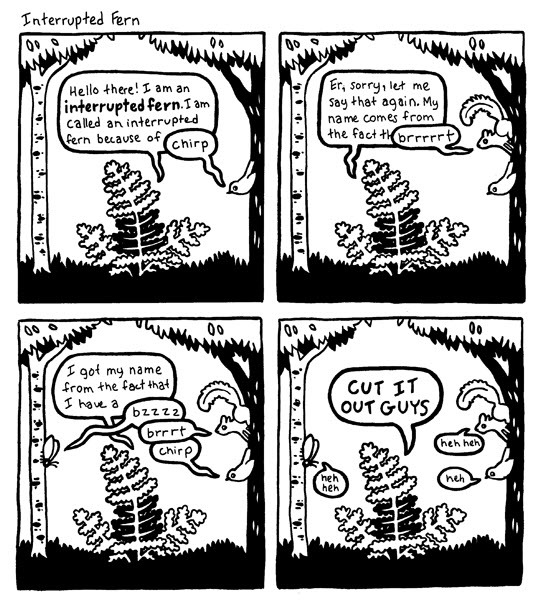 Here’s a cartoon about interrupted fern It’s from “Bird and Moon” (LINK). 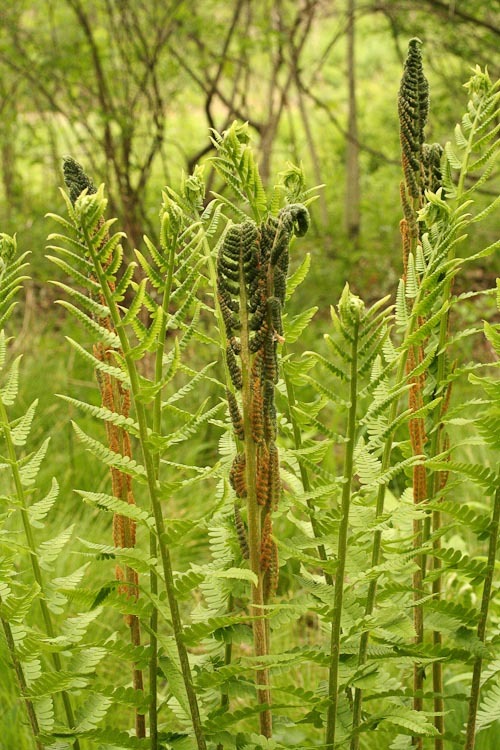 Royal fern, Osmunda regalis, is also heteromorphic. 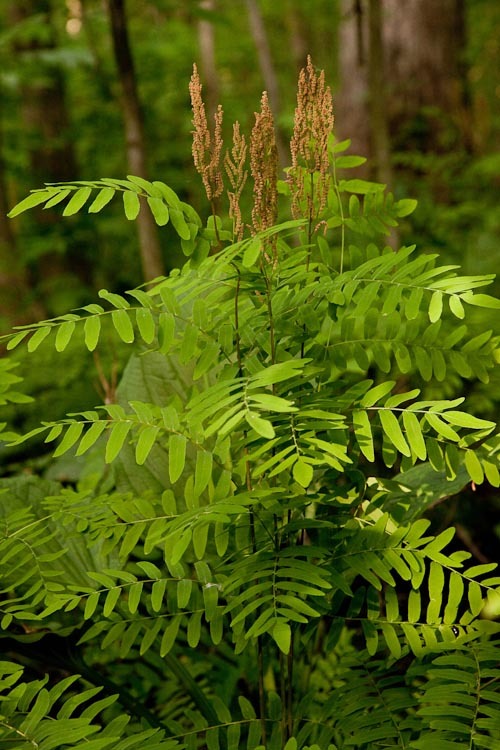 This big swamp plant has a tripinnate frond dissection type, with very large leaflets, giving it an aspect vaguely suggestive of a blacklocust tree. The fertile pinnae (leaflets) are at the tip of the frond. 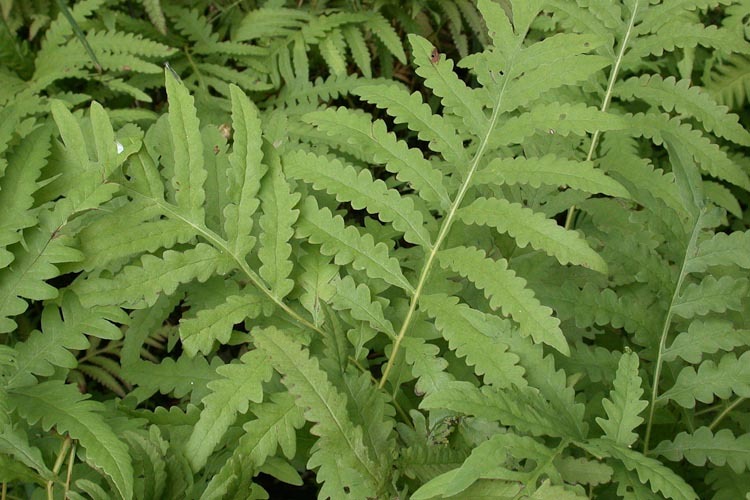 Royal fern is a huge swamp plant, with large leaflets. Rattlesnake fern, Botrichium virginianum is a woodland fern with a tripinnate frond dissection type, and a heteromorphic frond type. 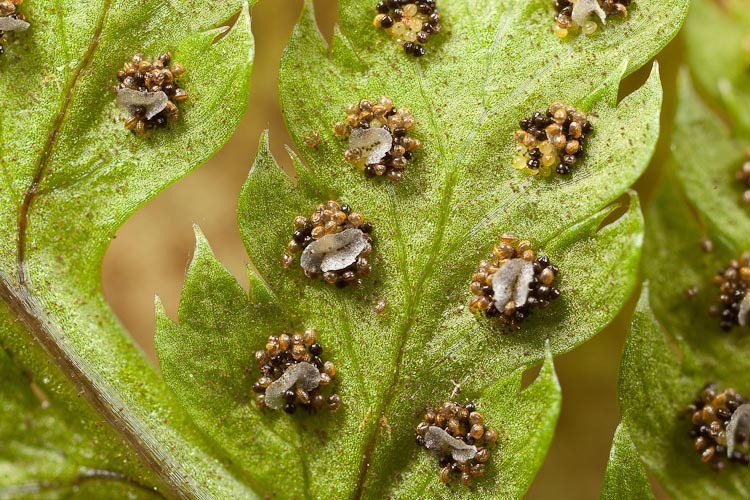 It is a type of “grape fern,” so-named because its huge sporangia are in somewhat grape-like clusters. 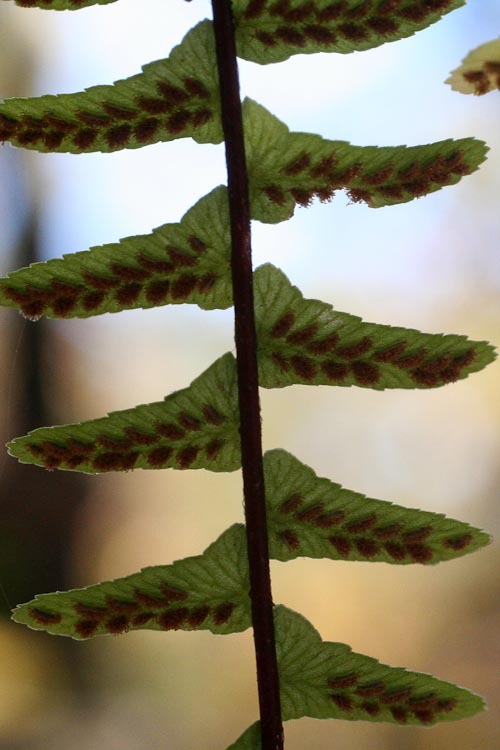 Rattlesnake fern has a heteromorphic frond. resembling a rattlesnake’s rattle, or a cluster of grapes. 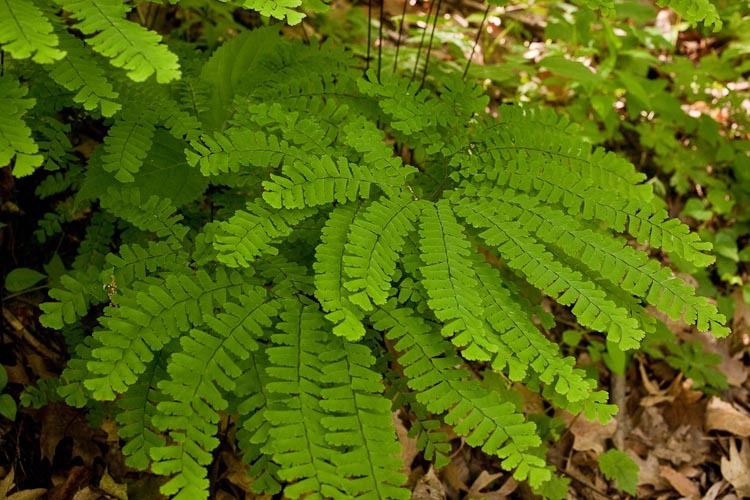 Maidenhair fern, Adiantum pedatum is delicate woodland fern with a distinctive frond that splits into arcuate segments, each bearing leaflets that are again divided. Maindenhair fern has a thrice-compound, uniquely arc-shaped frond dissection type. The maidenhair frond type with respect to spore production is monomorphic. The sori are at the margins of the leaflets, covered by a false indusium. Maidenhair fern sori are marginal, with a false indusium. Having a fairly strict fidelity to the tops of large rocks in wooded areas, rock-top polypody, Polypodium virginianum, has a deeply pinnatifid frond dissection type. Polypody fern is pinnatifid, and grows on rocks. 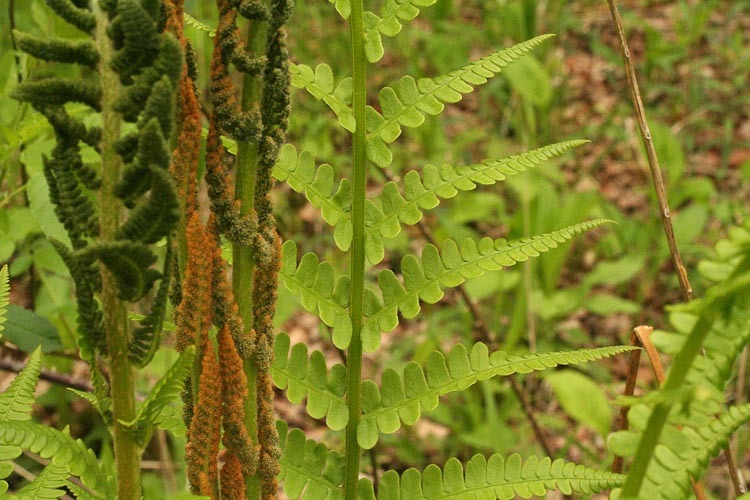 Polypody’s frond type with respect to the production of spores is monomorphic. It produces quite large sori that are naked, i.e., entirely lacking an indusium. Polypody sori are large and naked. Christmas fern, Polystichum acrostichoides, has a fully pinnate frond dissection type. 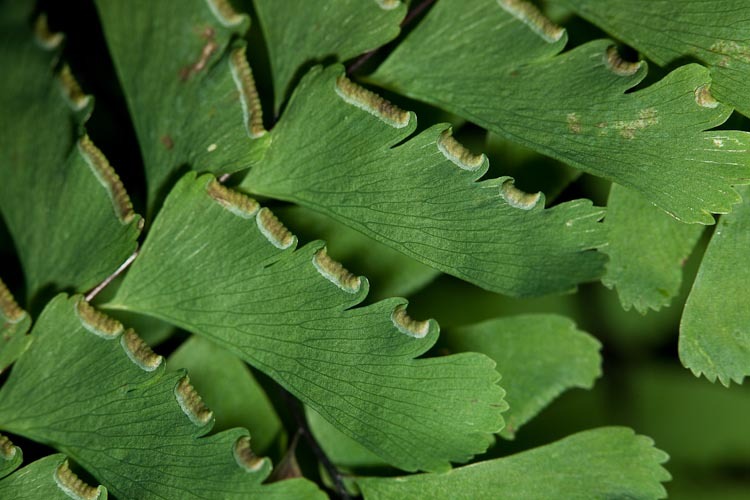 Moreover, the Christmas fern fron type with respect to spore production is heteromorphic, wherin the terminal portions of many of the fronds have abruptly reduced leafllets beneath which are produced many confluent sori, each covered with a peltate indusium. SWIPE ARROWS LEFT to see PELTATE INDUSIA! 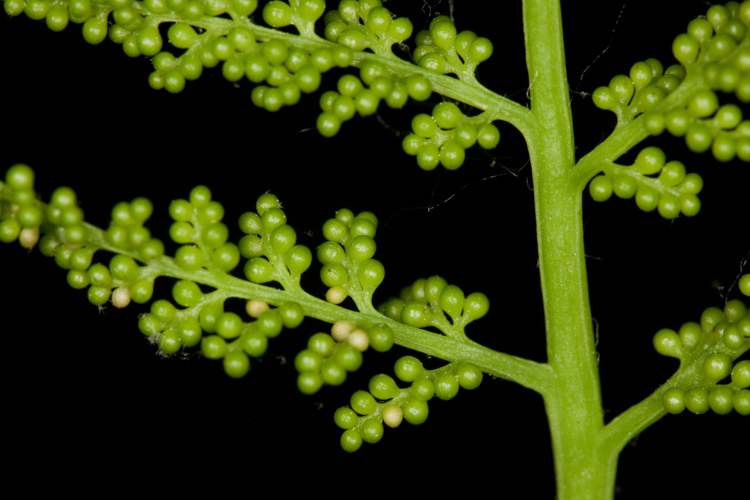 The frond is heteromorphic, with terminal leaflets bearing sporangia. Ebony spleenwort, Asplenium platyneuron is shaped mich like Christmas fern, but is much smaller and has a monomorphic froind type with respect to the production of spores. Theebony spleenwort indusium is linear. Ebony spleenwort has a pinnate frond dissection type. The frond type is monomorphic, with linear indusia. 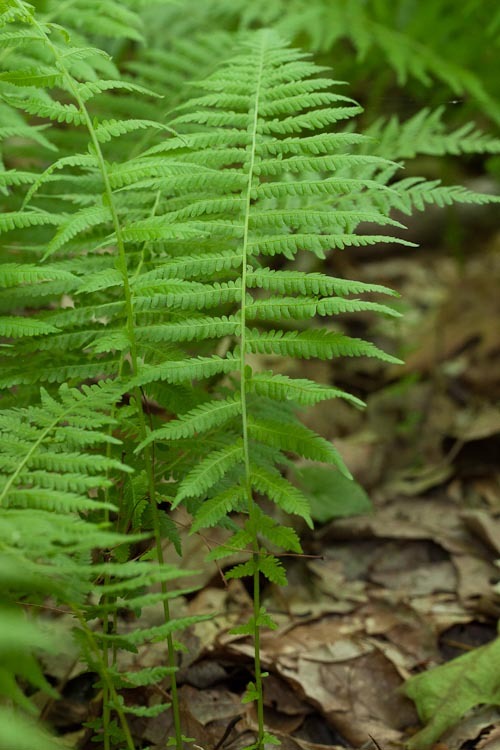 New York fern, Thelypteris novaboracensis is a small woodland fern with a deeply pinnate-pinnatifid frond dissection type that has a distinctive overall shape: the frond is tapered at the top and the bottom. (Do New Yorkers “burn their candle at both ends”?) The frond type with respect to the production of spores is monomorphic, with reniform indusia. New Yorkers burn their candle at both ends. 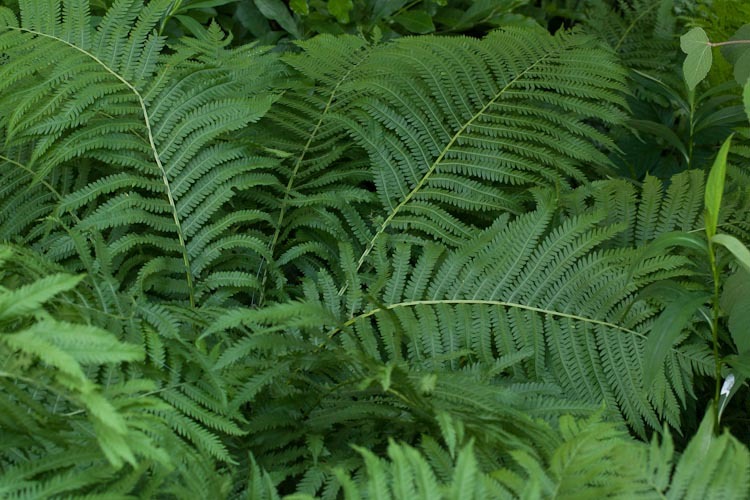 Spinulose woodfern, Dryopteris carthusiana (also called D. spinulosa) is a typical woodfern, growing in circular clumps, with fairly well-divided monomorphic fronds with a reniform indusium type. This particular species is distinguished by its unequal-sided lowermost pinnae, wherein the sub-leaflets on one side are longer than those on the other. 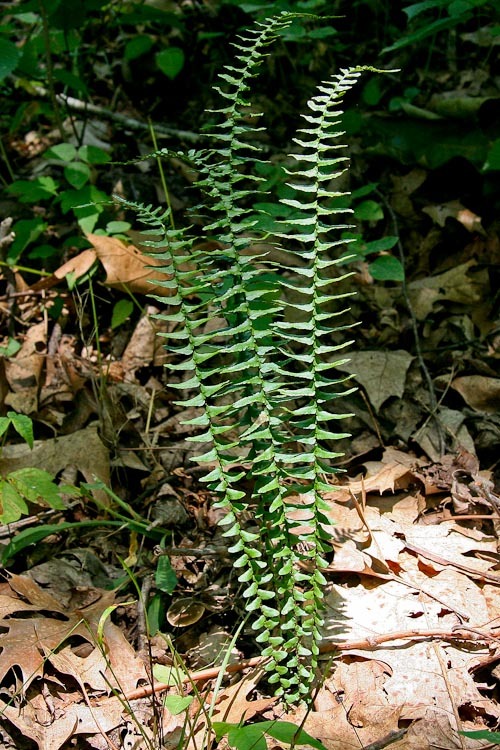 Spinulose woodfern is tripinnate, and monomorphic with respect to spore production. Note the strongly unequal-sided lowermost pinnae. Looking sort of like a HUGE New York fern, Ostrich fern, Matteuccia struthiopteris is a swamp plant that is further distinguished by its frond type with respect to the production of spores. Ostrich fern is dimorphic. Ostrich fern is a large fern with a pinnate-pinatifid frond dissection. Note that it tapers to the base. The ostrich fern fertile frond is much smaller, but with the same overall shape. Ostrich fern fertile frond is entirely devoted to spore production. Sensitive fern, Onoclea sensibilis has a distinctive bipinnatifid frond disxsection type. 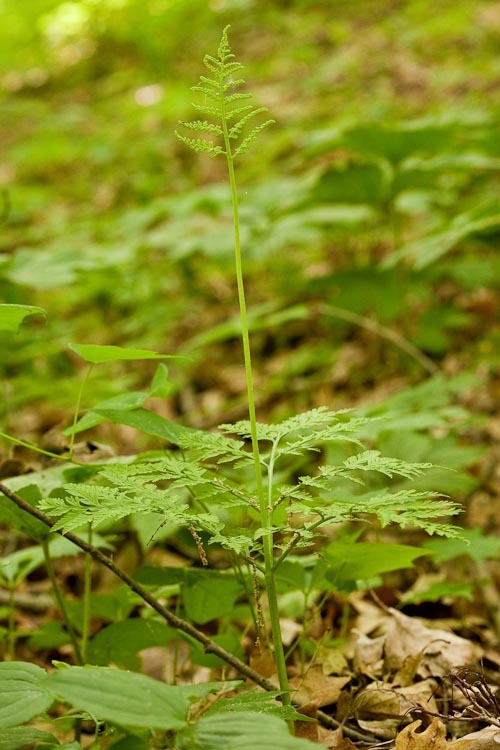 The frond type with respect to spore production is dimorphic. Sensitive fern, so-named because of a sensitivity to frost.